Vintage Leaf Memories - Michael Langlois: They don’t have to be Leafs—but what players do you have a good old-fashioned “rooting interest” in? They don’t have to be Leafs—but what players do you have a good old-fashioned “rooting interest” in? I was checking out a baseball game the other night, and while I don’t have any particular interest in the Colorado Rockies, I was definitely pulling for Jamie Moyer, the 49 year-old left-handed pitcher trying to make a comeback with the National League team. I well remember Moyer as a, well, middle of the road junk-ball (off-speed, at least) pitcher more than twenty years ago. To me, he was an OK pitcher, but kind of nondescript, in major-league terms—meaning, he was obviously good enough to play in the big leagues, but not a star by any means. Here were are, in 2012, though, and this old guy, coming off Tommy John surgery of all things, has pitched some decent games and actually won a couple for the Rockies. I don’t think he has enough gas left to get to 300 wins in his career (he scuffled a bit in his last start, but I think he has close to 270 big-league victories). When all is said and done, he’s had a remarkable career—and now I find myself really pulling for him. This got me thinking about the hockey world, since I spend a fair bit of time on that subject here at Vintage Leaf Memories. I started pulling my thoughts together about players I just flat out like—not necessarily Maple Leafs, just players that, for any number of reasons, I have a fondness for. One that springs to mind is Ilya Kovalchuk. I say Kovalchuk, because he was my youngest son’s favorite player a decade ago when my son is getting into hockey and Kovi was drafted by and started playing with the expansion Atlanta Thrashers. He has always been a brilliant offensive performer. While I’ve often criticized Lou Lamoriello for making what I thought was a poor trade with Atlanta, and then re-signing Kovalchuk to an insanely lucrative contract thereafter, the guy is a flat-out exciting hockey player. And now, he’s showing something extra as the Devils try to survive an intense “final-four” encounter with the Rangers. Zdeno Chara is another non-Leaf I’ve come to admire over the years. (Daniel Alfredsson, too, though I can’t honestly say I pull for Alfredsson…). I think Chara has a lot of heart and plays the game the right way. He’s a winner, a quiet leader, and a guy you can build a team around. I’ve always liked Shane Doan, though I know that’s a trendy “pick” these days, for obvious reasons. I used to pull for Marian Gaborik when he was with Minnesota. I loved the fact that the guy could put up such good numbers despite playing with a stifling defense-first team in Minnesota, but I can’t conjure up much enthusiasm for his work with the Rangers. (Neither can Tortorella some nights, it seems.) I’m just not a Ranger guy, I guess. Never have been. Can’t imagine I ever will be. In Edmonton, Jordan Eberle is a young player I think a lot of. He plays a well-rounded game, brings passion to his work and a ton of skill, too. And hey, how do you not cheer for someone like Teemu Selanne? 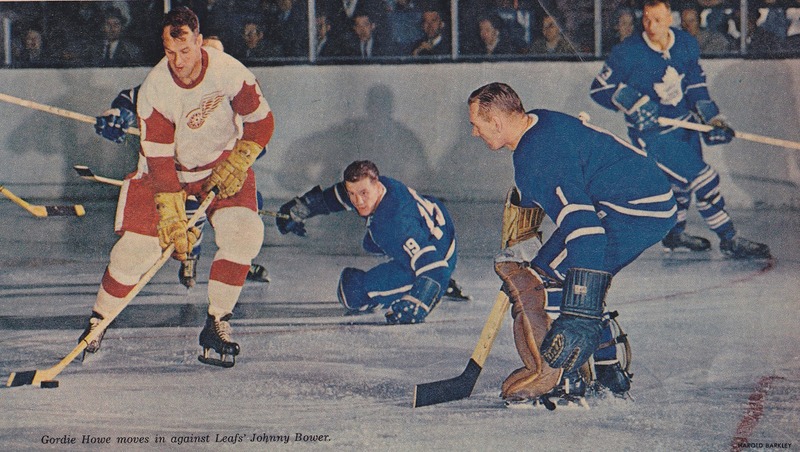 Now, back in the "old days", while I hated a lot of Leaf rivals, I nonetheless developed a great respect for a number of “non-Leafs”, including Gordie Howe (seen above in early '60s action against Johnny Bower and the Leafs, in one of those wonderful Harold Barkley photos), Gilbert Perreault and Richard Martin in Buffalo, Rod Langway in Washington and more recently guys with big hearts like Kris Draper in Detroit. There are a lot of players worth cheering for, for all minds of good reasons. So who are some of the players that you just have a natural rooting interest in—and why? I am rooting for the Marlies kids. Philippe Dupuis, Nicolas Deschamps and Jerry D'Amigo scored. It was D'Amigo's eighth goal of the playoffs, tying him with teammate Matt Frattin and Norfolk's Alexandre Picard for tops in the league. Both D'Amigo and Dupuis are playing at a point a game...12 in 12! Thanks DP. I think the Marlies have indeed captured the imagination of a lot of fans...D'Amigo, Frattin and all the players you mentioned. I like Kovalchuk as well. A player that dynamic is tough not to like. I really like the three big scorers in Anaheim - Perry, Getz, Ryan. And I'm a fan of Eric Staal and Mike Richards too. On D, I suppose my current favorites are Doughty, Letang and Campbell. And I was a big fan of Scott Neidermayer when he played too. Now that the IceCaps are in St. John's I'm a huge fan of Patrice Cormier. Thanks for sharing those names, Ryan. I'm a Staal guy too. (I'm probably even more of a Jordan Staal fan...) And I like Letang, as well. Love Kovy. As a former "soft" player myself, I have a weakness for guys who are skilled, smart, but maybe don't have the physical dimension to their games, but nonetheless ARE competing out there. As such, I always liked Pierre Turgeon. The type of player who couldn't knock a creampuff off of the dining room table, but was a smart, smart player with a nose for the puck and a knack of knowing where to be. Probably the only PT fan outside of St Louis, Long Island and Buffalo! I share your Kovy love too. Just a terrific combination of smarts and skills, with a dollop of grit and attention to defence. Watching he and Parise is a joy, and those two are one of many reasons (Marty, Tortorella, loathing of the Rangers style of play) I'm rooting for the Devils to win. Craig, I appreciate your self-reflection and the point that many so-called "soft" players are indeed competing out there. In sports like hockey and soccer, not everyone is a physical player. Some have skill, some have vision, smarts. Some are a nice combination of skill and smarts, as you note. Not many bring all of the above to the stable. Great point on Turgeon. Under-appreciated in many ways. So much depends on perception, the team you are on and expectations. He was a wonderful talent. Yah, I have cheered for players on other teams, rarely. Oh why did the Leafs screw up TWICE on getting Joe Sakic??! ?